As a twenty something I was the definitive music snob. If one of my favourite 'unknown' bands dared to even consider courting a bit of critical acclaim, I could, and often would, devote my attention elsewhere. Similarly if the same band even momentarily considered leaving my current favourite little known 'tiny records' label and sign for a major...well they were literally dead to me. Just like the 90's, when 'my Britpop generation' purveyed our version of music snobbery, the 1960's had their version. This largely revolved around the time that elapsed between records and was the reason why this album did not receive the same critical acclaim that Tambourine Man, had garnered just 6 months before. 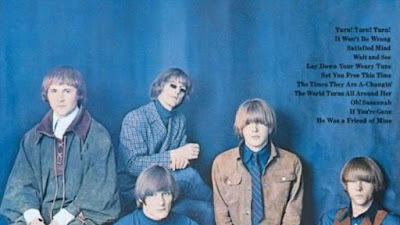 For the lack of time in between releases, obviously was received by 60's music snobs as indicating that this sophomore album was just a prefab construct, cobbled together from the rejects and outtakes from the debut, whose sole purpose was to act as a holding ground release that would ensure everyone could maximally benefit from their newly proven commercial appeal. To many the album was merely a victory lap played to the imagined aural backdrop of fluttering bank notes. If I had been the musical snob of my previous life in the 1960's, I would not bothered to have purchased the vinyl and muttered to all that would listen all of the above. However as I have now become the sort of mature musical analyst that exists mainly in my dreams, I can now see that the album defies all such detractors. Initially there is no question of quality. Tracks such as the the Pete Seeger / The Limeliters cover, Turn Turn Turn jangles and shimmers with as much aplomb as anything on Mr Tambourine Man and in fact, in my humble but ultimately correct opinion (?! ), it is actually the best single the band ever produced. Other tracks such as 'It Won't Be Wrong' and the beautifully languid He was a Friend Of Mine (see below) are also essentially typical of the quality of the majority of the album. Another area in which this album defies the critics is in the guitar work of Roger McGuinn. 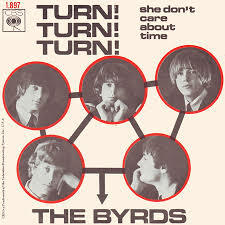 Perhaps considered the secondary attraction on the debut, the young McGuinn begins to find his foothold in the band starring in the more rock/power-pop tracks such as It Won't be Wrong and Wait and See (see below). This is interesting as not only does it hint at the McGuinn prominence that the band would take in the post Gene Clark era, but it also shows a rare glimpse of the nibbles of muted power-pop they ultimately rejected in view of the stiff competition from the British invasion type bands that were rapidly invading American shores. Also this album sees Gene Clark's last contribution before leaving the band as he was afraid of flying and/or he thought he could make it solo considering he was the 'pretty boy' of the band. Pretty boy or not, there is no doubting the unique quality of his voice, that almost feels as though it adds an extra treble guitar to the already beautiful mix. A track such as Set You Free This Time showcases a beauty that the band never really replaced. Fifty plus years after this release and with the pretensions of the 1960's era now irrelevant, this album, whilst not replacing Mr Tambourine Man as The Byrds magnus opus should be allowed to stand shoulder to shoulder with it and exude equal pride. LOL...Certainly audacious George. The band were truly great. Introduction - Hello from janglepophub !! !